Sorry I haven't gave a update on Peanut Bunny lately. Honestly, I haven't even blogged for a while. Ma and dad are doing some work on the house and when they stop at night, ma crashes. While she was resting in the bed, Peanut Bunny came to hang out with all of us. He is a really good rabbit. Peanut Bunny loves to play in the covers. He will go under, over, under, over, dig dig dig and then throw that blanket around. He seemed to enjoy the game of hide and seek. Peanut Bunny has been able to gain weight. You can no longer feel his backbone or ribs. We finally found a food that he likes. His nails have been clipped down also. No more long nails for Mr. Bunny. He LOVES to be out of his cage. He would love to be a house bunny. He hops around and popcorns in the air. Popcorning is where they jump and kick their heels up. I know with guinea pigs, it means their happy. Hopefully it means the same in rabbit language. He is also LITTER BOXED TRAINED!! A rabbit that poops in a litter box!! Yay Peanut Bunny!! He gets along with us dogs and the cats. He likes to play with Dae Dae because he runs with him. He doesn't like straw or any bedding in the area he lays in his cage. He likes to lay on the plastic bottom. That is probably because he didn't have any bedding before he came to us. One of our friends brought their grand daughter over to see him. At first Peanut was leery of the girl but he warmed up to her really quick. We were happy to see he could trust kids. The only issue we haven't gotten through yet is when putting him back in his cage. He starts kicking with his back legs and he can scratch you really bad. He isn't as bad as he was but he still needs work. Ma works with him everyday. She takes him out of the cage and kisses and loves on him but then she tries to put him back and he fights. This is why I think he would like to be a house rabbit and be able to go back in his cage when he wants to. Maybe he needs a cage that opens on the side instead of from the top. He has a cage like that but it is easier for ma to use the top opening cage to feed, get him out or give hay. Peanut Bunny is looking for his forever home. He comes with a cage, food and hay. He is around 1 years old and is healthy. He is even getting a spark to his eyes. He has given us a list of what he is looking for in his person. 🐰 Must feed timothy, oat, meadow and alfalfa grass. He likes it all mixed up like a salad. 🐰 Prefers his person to be an outdoorsy type. This way you can gather him a small amount of clover, dandelion leaves or a little clump of green grass. Only from NO CHEMICAL TREATED YARDS. 🐰 House must have boxes or bench type seats he can take naps under. He is adventurous and is willing to try new types of houses. 🐰 Would prefer someone who likes pet him but also allows his some space. 🐰Prefers someone who doesn't mind cleaning up his messes. He sure likes to spread his snack foods out. 🐰 MUST absolutely, positively love him his whole life and promise to love and care for him though good times and bad, sickness and health and keep him flea free. 🐰 Promises to kiss him everyday and tell him he is handsome. Peanut Bunny promises to be the best rabbit he can and not to be afraid to try new things or new experiences. Do you know someone who has been looking for a rabbit? 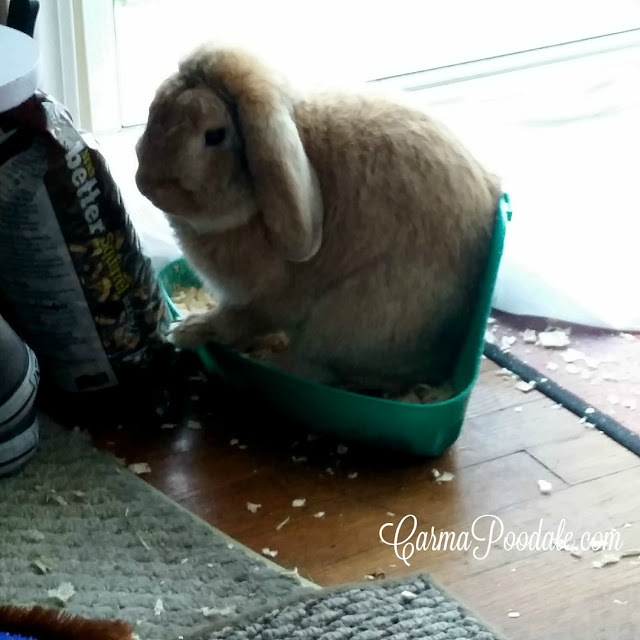 Do you think Peanut Bunny's list of wants is too much? You are quite the finicky rabbit but you are tasty. Wait, I meant CUTE! Or did I??? Best of luck with the forever castle. 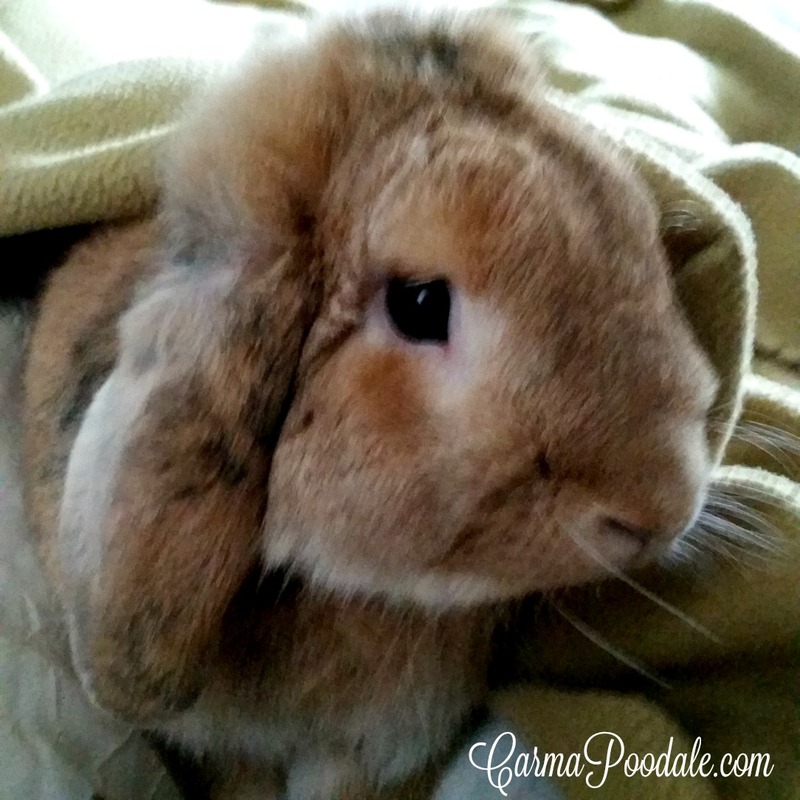 Peanut Bunny is beyond adorbs! Here's hoping he finds the pawfect fur-ever home soon! I think there is someone for everyone. Keep on learning Peanut Bunny, I'm sure your forever home is out there! We believe that too. Thank you for helping us to remember that. sometimes we sorta forget. Happy Weekend jodi. Thank you Rachel. You just gave us the best feeling by saying we are doing good. We are trying our best to find him a home where he doesn't have to be the cage so much. If the kid hadn't moved back home from college he could have her room but until she leaves, no big room for him.